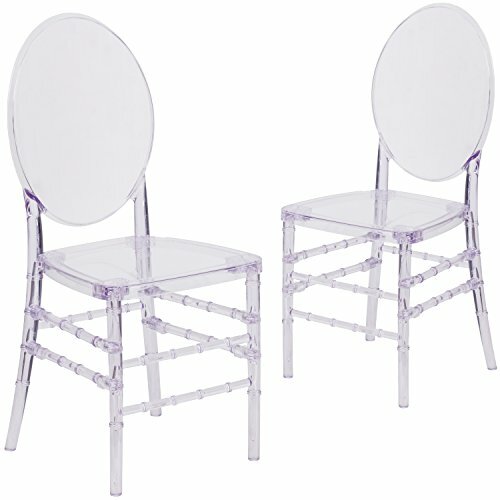 The Elegance Crystal Ice Stacking Florence Chair is ideal for weddings, banquets and special events, whether indoors or outside. Constructed of ultra-strong polycarbonate, it is shock, scratch and water resistant, extremely strong and wobble free. It’s crystal clear all the way through, so you don't have to worry about cosmetic nicks ruining the appearance. This chair is UV treated to help prevent fading and discoloration. Your chairs will look great for years to come. These chairs ship fully assembled, and can be stacked 8 high for storage.With its durable, lightweight construction and classic styling, this beautiful chair will become the prime seating choice for all of your special events, from casual to elegant.